This week's Murdoch news raises as many questions as it answers, as the phone-hacking scandal enters its second year dominating front-page headlines worldwide. But the controversy that has rocked Murdoch's British empire has caused little more than a ripple among America's political leadership. On Monday, we learned that Rupert Murdoch had resigned from the boards of a number of News Corp. subsidiaries, including News International Group, Times Newspaper Holdings and News Corp. Investments. These companies oversee British newspapers the Sun, the Times and the Sunday Times. They also oversaw the News of the World before it was shuttered last summer as evidence of widespread phone hacking emerged. On Tuesday, U.K. authorities leveled charges against former News International executives Andy Coulson and Rebekah Brooks, who held top positions at the company. The two are among eight News International associates facing charges on 19 counts of conspiracy over the phone-hacking scandal. They and others allegedly tapped the cellphone conversations of hundreds of people -- from celebrities and politicians to innocent crime victims -- and then sought to cover up their actions. What's not yet known is whether the two developments are related: Did Murdoch decide to distance himself from his British newspaper subsidiaries after being tipped off that charges were imminent? We also don't know the extent to which these prosecutions may bring to light evidence that crimes were committed on U.S. soil. Among the 19 charges are allegations that News Corp. employees hacked into the phones of Angelina Jolie and Brad Pitt. Another celebrity, Jude Law, alleges that his cellphone was hacked while he was transferring between flights at New York's JFK International Airport. The U.S. component of these allegations remains unclear, but it will likely have bearing on the ongoing investigations at the Department of Justice and FBI. A related British investigation, Operation Elveden, has led to the arrests of more than a dozen News Corp. staffers at the tabloid the Sun on suspicion they made illegal payments to police and other public employees. These allegations in part triggered the DoJ investigation into violations of the U.S. Foreign Corrupt Practices Act, which forbids representatives of U.S. companies from bribing foreign officials to further business interests. On that score, British investigators are sharing evidence with the Securities and Exchange Commission and the FBI. Were U.S. prosecutors to bring charges against News Corp. executives, it would signal a dramatic escalation of a scandal that threatens to ruin one of the world's most powerful media companies. 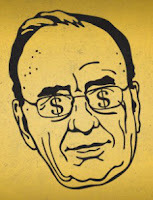 Until recently, Murdoch was so influential in the U.K. that the nation's leadership routinely sought his favor. But in the last year his power has eroded in London as politicians now view ties to the media mogul as more of a liability than an asset. Look no further than Prime Minister David Cameron's recent attempts to downplay his embarrassing courtship of Murdoch before, during and after his election. Nor has the scandal had any measurable impact on Murdoch in the minds of Wall Street investors: News Corp.'s stock price has held steady despite this week's news. But as the currents continue to pull at the foundations of Murdoch's empire, it's only a matter of time before the News Corp. scandal becomes an American story. Things could be about to get a lot worse for Murdoch and News Corporation. Directors within Rupert Murdoch's News Corporation could face corporate charges and prosecution for neglect of their duties, in plans that are being examined by the Crown Prosecution Service. News Corporation should be prosecuted by the FBI and the Justice Department. Fox News television channel had a “black ops” department. settlements to hacking victims and admitted misleading parliament.